For the treatment and control mature and immature stages of the following parasites in horses: Parascaris equorum, Habronema sp, Oxyuris equi. Large migratory strongyles: Strongylus vulgaris, Strongylus equinus, Strongylus edentatus. Small non-migratory strongyles: Triodontophorus sp, Trichonema sp and juvenile forms of Gasterophilus nasalis and Gasterophilus intestinalis (bots). 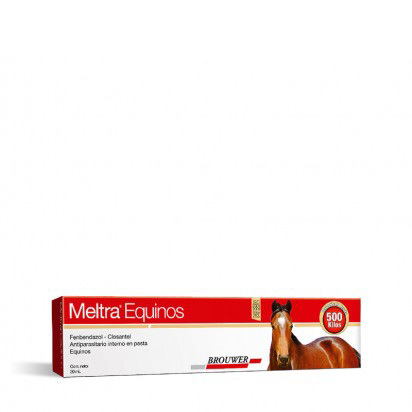 Meltra is indicated for the prevention of verminous aneurysm caused by migratory larvae of Strongylus vulgaris. Disposable syringe containing 20 mL.